This, for you city types, is a potato flower. Country types will recognise its similarity to the tomato flower, a sound alike name, a close flower family relative among the Solanaceae. Lamenting the lack of pollinators in the garden, that will not keep these plants from producing, as it is their roots and not their fruits we eat. For plants in which the fruit is the edible part, of course, if the embryo inside each seed doesn’t get spermed (boy meets girl, pollen nucleus finds egg nucleus) then the embryo’s womb as it were–the flesh of the apple or “meat” of a squash, may not grow very much, and even if it does, there won’t be any sexually derived genetic variety for the next generation. But that is just so much agro-biology. I can’t say that I’ve ever noticed potato flowers going to fruit, but we have them out in the garden now–half-inch round orbs (coincidentally, very tomato like) that resulted from potato flowers “going to seed”. I’d thot I’d have take a picture of a cross sectioned potato fruit for a small insert here, but I got lazy AND rained out yesterday. I may yet become so at a loss for subject matter that I show you the inner anatomy of a potato fruit, as it is summertime and the photography is not easy. 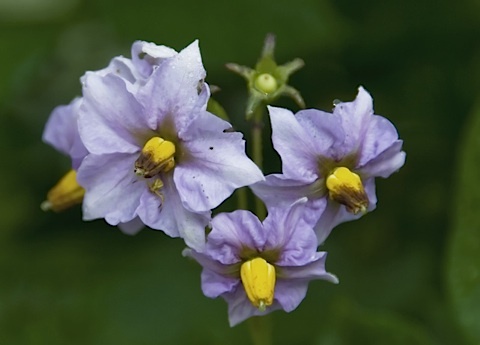 Very pretty petals, and very interesting to think about what a potato’s fruit looks like. I would like to see your photo of one.